Harvey Gettleson and Larry Witzer founded Gettleson, Witzer & Company in 2000 after leading the business management practice at Ernst & Young for many years. 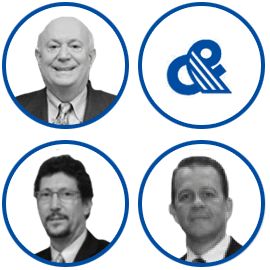 Randy O’Connor joined Harvey and Larry in 2004 to create Gettleson, Witzer & O’Connor. Gettleson, Witzer & O’Connor is a full scope business management practice providing comprehensive tax, accounting and advisory services to individuals – members of the entertainment community, family offices, entrepreneurs, corporate executives, real estate professionals and high-net worth investors. We provide very personalized services to our clients, focusing on their specific needs and objectives. Every engagement is tailor-made for our clients’ financial situation. The Firm’s range of services is flexible and changes as our clients’ needs evolve. The financial well-being of our clients is our central theme… and all of us strive to provide the highest quality, timely and innovative services to each client… every day. We take pride in our old school approach – focusing on client service directly from the senior members of our firm. Every client, under the supervision of Harvey, Larry, Randy or a senior executive, receives a core offering of accounting and tax services, including tax consulting, planning and compliance, as well as financial recordkeeping. In addition, we work with each client to develop a comprehensive financial plan that includes setting goals and objectives to achieve financial independence and security. Many clients rely on our firm for all major financial decisions ranging from the purchase of a house, wealth accumulation strategies, obtaining proper insurance coverages, estate planning, and evaluating various financial, business or investment opportunities. By being dedicated to our old school approach, our clients know they can reach their business manager on a 24/7 basis, and take comfort that their contact is with an experienced executive for all matters... big or small. GETTLESON, WITZER & O’CONNOR SELLS NO PRODUCTS AND DOES NOT PARTICIPATE FINANCIALLY IN CLIENTS’ DECISIONS. We serve as a true independent resource in our clients’ financial life. Decisions are coordinated with outside professionals with specific areas of expertise to provide a comprehensive, integrated solution. Each client benefits from the Firm’s wide range of contacts to obtain the best advice in developing their financial plans for investments, insurance, business strategies and legal needs.